NITROBOLON ENERGIZER is the newest generation multi-component "stack" pre-training enhances strength, endurance and speed of contraction of muscle fibers. NITROBOLON ENERGIZER combines high doses of the most potent ingredients with energizing and stimulating. The preparation increases blood circulation, nutrition and oxygenation of the muscles, and effectively increases their performance when working under heavy load. 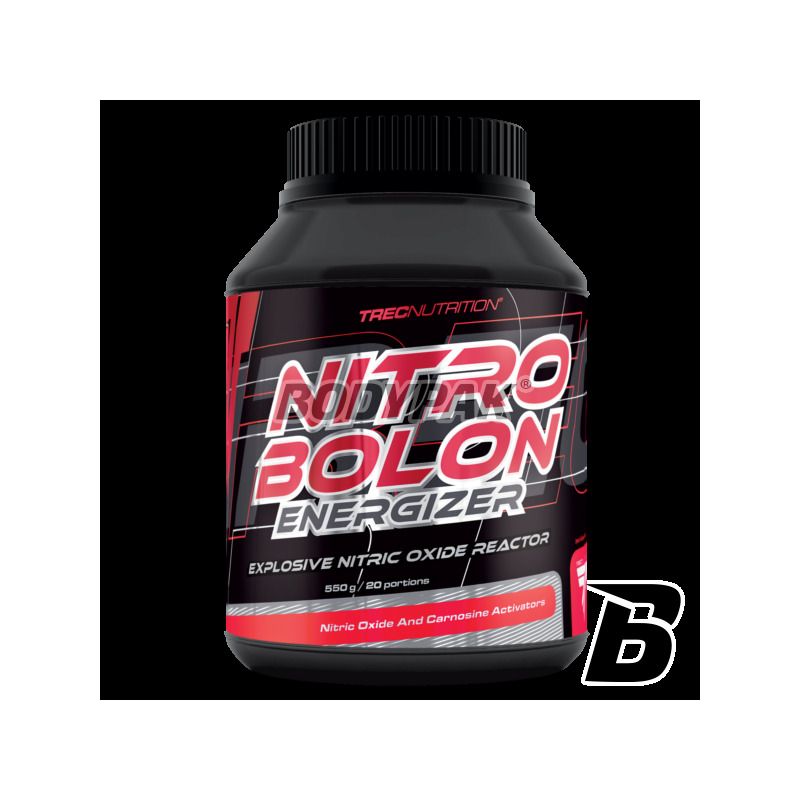 NITROBOLON ENERGIZER is recommended as a means of anabolic-energizing for strength athletes, speed-strength and endurance. NITROBOLON ENERGIZER - is a combination of the four most effective form of creatine with trade increasing strength, stimulating and accelerating regeneration and inhibit catabolism. 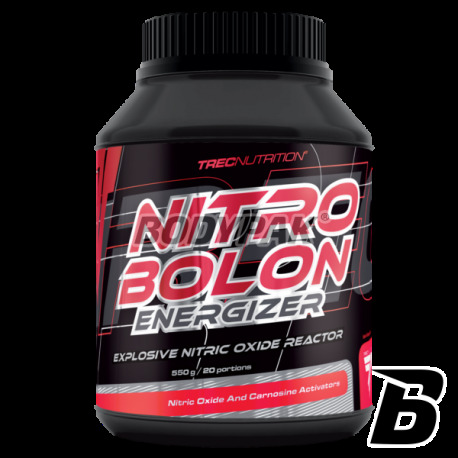 The Nitrobolon Eenergized includes: Creatine Monohydrate, Creatine Malate, Creatine Ethyl Ester, Kre-Alkalyn. Creatine influence on a number of factors related to our organism: He participates in the transport and rebuilding of ATP - ATP serves as an energy carrier in our body, without it the course of most reactions, ranging from simple synthesis of the muscle contraction, would be impossible. Creatine for its ability to bind phosphate groups (then transformed into phosphocreatine) participates in these, transport and rebuilding of ATP. Exhibits antioxidant properties - helps fight dangerous to health, free radicals. It also prevents a number of harmful effects arising due to oxidation during exercise. L-Isoleucine - providing large amounts of Leucine lowers the level of the other two amino acids isoleucine and valine is why it is so important to use all three compounds together. Additionally, isoleucine is known to be amino acids glukogennych that is, that the body in an easy and fast way can be converted to him necessary for the functioning of energy. This means that we will be able to train longer and harder and recover faster. L-Valine - its presence in this combination, not only due, mentioned earlier, the need for administration of all three BCAA together but also to reduce the impact of fatigue of the central nervous system. In addition, as in the case of the other two amino acids, it is easily converted into energy for working muscles and thereby saves glycogen stored in the liver. Inosine - a precursor of Adenosine, accelerates recovery in inventories of adenosine triphosphate (thus increasing the power and explosive strength) as well as optimizes the use of oxygen by the body (which in turn helps to improve performance). L-glutamine, N-acetyl-L-glutamine - provide the body with glutamine, the most commonly present in the amino acid that plays a number of very important functions: alters the filling process, glycogen by increasing the rate of its synthesis in the liver, as well as by direct conversion to glucose , has a positive effect on the rate of protein synthesis and reduces their breakdown, strengthens the immune system and prevents diseases that could hinder training plays an important role in the process of transamination (allows the synthesis of new amino acids), is converted into glutamic acid constitutes a source of energy for the nerve tissue, and fully a number of other important, but less important from our point of view, the function. Arginine alpha-ketoglutarate, Malate Arginine - is involved in the formation of nitric oxide and thus has the ability to expand blood vessels, allowing for better blood circulation in the muscles and soft tissues. Indirectly involved in the synthesis of cGMP which, together with ATP is involved in muscle contraction and has an anabolic effect. It affects the secretion of growth hormone, supports the process of liver regeneration is an important precursor for creatine. Taurine - helps regulate blood sugar levels, exerts anti-catabolic (reduces protein breakdown), increases the concentration of nitrogen in the body and helps lower cholesterol. Very important is the fact that taurine stimulates the pancreas to secrete insulin. It does, however, other than glucose, thus reducing the risk of insulin resistance that leads to diabetes. This allows us to enjoy all the benefits of insulin - a strong anabolic - without worrying about our health. Additionally, especially in combination with caffeine has psychostimulant properties. L-Tyrosine - is a precursor to adrenaline, dopamine and norepinephrine (necessary for proper operation of the nervous system), stimulates, increases alertness and concentration. Caffeine - the most famous in the world relationship of a thermogenic. A stimulating effect, reduces the level of adenosine inhibits the breakdown of cAMP - thus strengthens occurring in the body processes thermogenic (release of energy created during the combustion of fats in the form of heat) and lipolytic (breakdown of fats into free fatty acids). Inositol - a naturally occurring carbohydrate polifosforylanowy present m.in . : bran cereal. It has potent anticancer properties (inhibits gene mutations hyperplasia of tumor and inhibits the formation of proteins that stimulate tumors to grow), fights free radicals, helps with kidney stones, reduces cholesterol, restores the proper functioning of the liver (affected by excess fat in the diet), helps to increase improved concentration and thinking processes. The serving of the product - 28 g (1 scoop) dissolved in 400 ml of water, using a shaker. Depending on demand use 1-2 servings daily. serving 30 min. before the first meal, II serving 30 min. before the main meal.